Two people fainted and a pregnant woman fell ill on overcrowded Borders Railway services, the Scottish Parliament has been told. MSP Christine Grahame raised the issue at First Minister's Questions. She said it gave her "no pleasure" to raise failures "yet again" on the Edinburgh to Tweedbank line. First Minister Nicola Sturgeon said ScotRail remained in the "last chance saloon" and must meet the commitments in its performance remedial agreement. Ms Grahame - who represents Midlothian South, Tweeddale and Lauderdale - told MSPs: "Just today there were two peak time cancellations and as a result of overcrowding on later trains two people fainted - one even requiring medical assistance. "There was also a pregnant woman made ill."
ScotRail confirmed on Twitter that a customer had been seen by emergency services. Ms Grahame said ScotRail Alliance boss Alex Hynes should get out and about on Borders trains to hear what her constituents thought of services. Ms Sturgeon responded: "I completely agree that this level of discomfort and inconvenience for passengers as a result of overcrowding in no way reflects the service level for which this government and indeed Scottish tax payers, of course, are paying. "I have been informed that the cancellations today are a consequence of a train that failed early this morning. "I will certainly reinforce to Mr Hynes and his colleagues the critical nature of providing a service that passengers can rely on and feel safe and comfortable to use." She said improvements across the country had been "patchy" and passengers in the east of Scotland were still being "let down by ScotRail". Ms Sturgeon added that Transport Minister Michael Matheson had met with senior officials from Abellio, the Dutch firm behind the ScotRail franchise, to reinforce the "absolute requirement for improvement". "I said a couple of weeks ago in this chamber that ScotRail is in the last chance saloon and I repeat that today," she said. "They must meet the commitments contained in the performance remedial agreement that they have now signed up to." 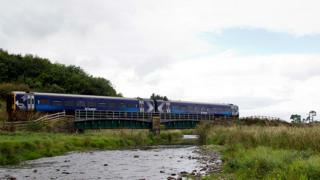 ScotRail said there had been two cancellations on the line and another service with fewer carriages than normal. However, it said that overall the last week had seen a "considerable improvement" for both punctuality and number of seats. It added that it regularly engaged with stakeholders and Mr Hynes often travelled on the route and had attended a meeting in Galashiels last week. A spokesman said: "We know that one of the biggest concerns for our customers is busy trains and we are really sorry to our customers who experienced overcrowding on the Borders Railway today. "It has been a challenging time for Scotland's railway, and everyone at the ScotRail Alliance is working flat-out to provide customers with the service they expect and deserve."